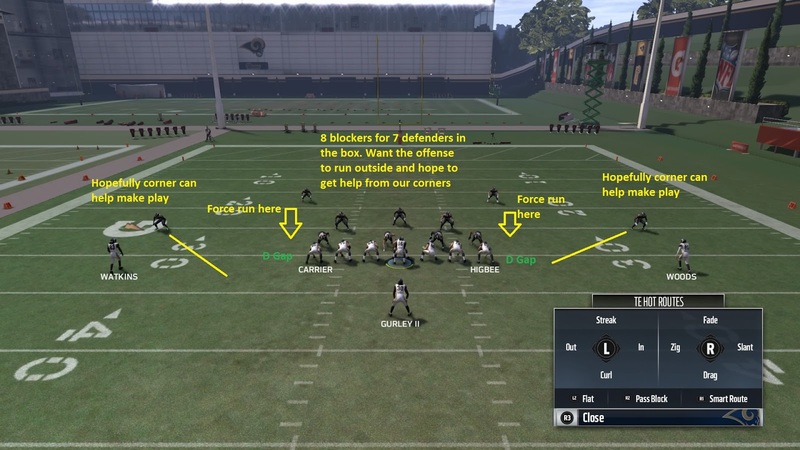 We talked attacking the gaps and why it is important for the running game. So now how does a defense deal with this? First, we have to understand in general the fewer gaps there are to run the harder it is for the offense to establish a run game. However, because of the threat of the pass and the threat of wide sweep play, there are usually gaps in the defense for offenses to run. So if you can't close ever gap on the line of scrimmage what do you do? You close the most dangerous gaps and force your opponent to run to the gaps with less space and more men. By the most dangerous gaps I mean two things. 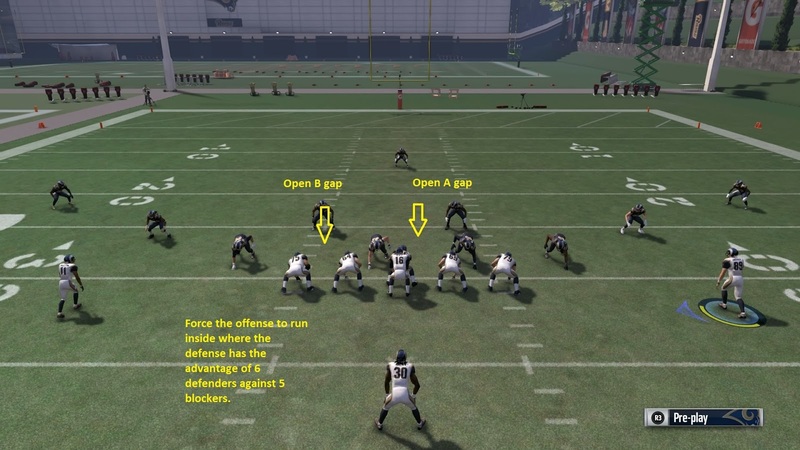 Gaps that are vulnerable to big plays and gaps your opponent tries to attack with their favorite plays. Gaps that are generally vulnerable to big plays are dictated by your defense. So if I'm playing a single high defense my extra defender is concentrated in the middle of the field so in general before I know my opponent's tendencies I want to funnel the runs inside the box as close to my unblocked defender as possible. This means I may leave the A gap or B gaps open so the offense will tend to run to those gaps. If I run a 2 high defense I may want to force more outside runs because I don't have the numbers in the box. This means I might leave the C or D gaps open so the offense runs there. Now, what about your opponents favorite runs. Once I start to see my opponent's tendencies I can do two things. If I'm not being hurt in the run game I can do nothing. If it's not broke don't fix it. If I'm being hurt in the run game I can choose defenses to close gaps that his run plays are attacking. As we spoke about before the offense wants to get downhill fast and limit the time defenses have to pursue. So as a defense we want to flip that and have the offense take as long as possible to get downhill while allowing more time for defensive pursuit. To do this the defense closes the gap their run play is trying to attack. Let's say the offense loves running inside zone(b gap run under center). 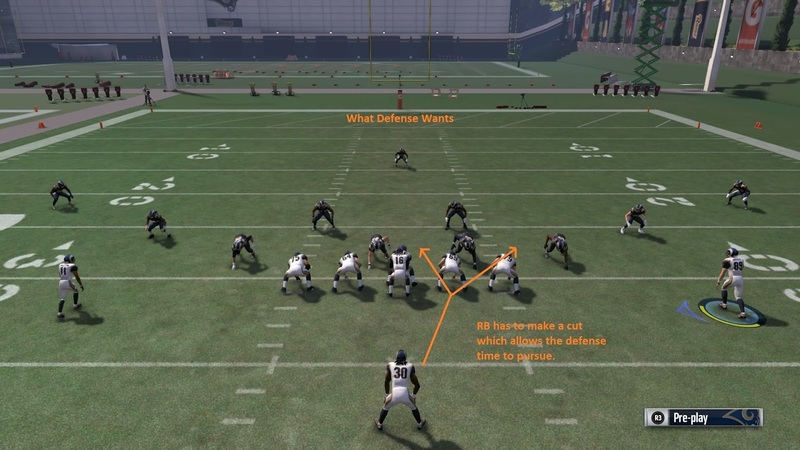 One thing the defense can do is get in a 4-3 defense look that places defenders in position by alignment to take away B runs(to one side in the example below). 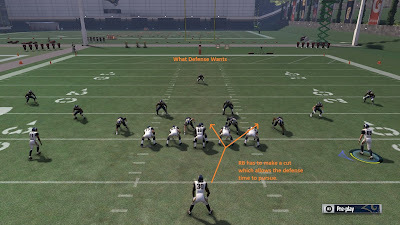 Now by alignment, your defense out leverages the blocks on the line of scrimmage. Your defensive linemen(all things equal) should make the runner cut back or bounce to allow for more pursuit and block shedding. The offense wants to get downhill as fast as possible. Ideally, they don't have to make any cuts to slow the runner down and allow for pursuit. The defense wants to flip this and make the runner make cuts to slow down the runner and allow for pursuit. 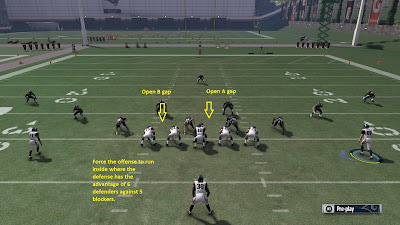 On the next post in the series, we will talk about how the alignment of the runner can tip you off to the type of plays your opponent will run, and what the aiming point(gap being attacked) might be. Thanks for reading please share and comment.